More than 180 golfers participated in this year’s golf benefit. “Toll Brothers is thrilled and fortunate to have the opportunity to raise money for such a great cause that contributes to the well-being of our community,” says Toll Brothers’ Deny Bart, one of the organizers of the event. “Our goal this year was to beat last year’s donation, and we did it! It’s all thanks to our sponsors that make it all happen along with our volunteers. We are looking forward to next year’s event,” Bart adds. 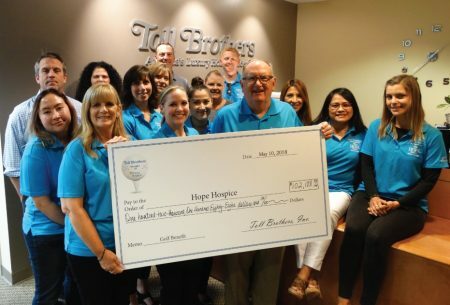 When the Toll Brothers event committee began planning for the 2017 golf benefit, their original goal was to raise $30,000 for Hope Hospice. They far exceeded that goal. This year they set an ambitious goal of $75,000 and again, surpassed that. “We are grateful for Toll Brothers’ support and thank their incredible committee,” notes Boehm. The committee includes: Deny Bart, Celeste Johnson, Andrew Gunson, Joel McMillan, Brian Thierrin, Todd Callahan and Dan Masterson.